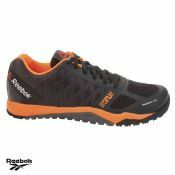 Description: Women’s Reebok ‘ROS Workout’ trainer. Features a Reebok logo on the front tongue and outer side. Also includes a front lace fastening and lightweight mesh exterior.